One of my botany heroes is Tony Foster. He’s been studying, caring for, guiding through and teaching about the New Zealand bush for over 30 years. I’m sure that this long-awaited book will be brimming with the same kind of quality content and beautiful images that his Bushman’s Friend blog and native plants site has already delivered. Can’t wait to get my hands on a copy. Heather Flores is a green garden goddess. She has a vision – for lawns to give way to gardens and those gardens to feed and sustain communities. And she’s written down the blueprint for this garden revolution in Food not Lawns: How turn your Yard into a Garden and Your Neighbourhood into a Community. Food not Lawns starts by putting you in the right headspace, a good non-preachy ‘why you should’. 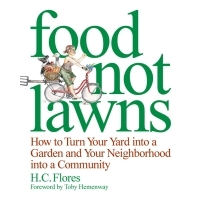 Flores then kicks into a really sound overview of the practical elements – how to gain ground, the water cycle, the living soil, plants, polycultures and seed stewardship. All this in a really friendly, engaging style. Then we go beyond the garden, reaching out into the community and working together, for and with the next generation.